Racing harnesses may seem like just an obligatory safety measure, but their configuration, design, and ease of use can also have big impact on both your comfort in the car as well as your ability to quickly and easily get belted in before races and during driver changes in endurance events. There's a number of options to consider when buying racing harnesses, so we've taken the most common questions asked by racers and turned them into this handy buyer's guide. So without further ado, let's dive in. Before you start to consider configuration and design options, it's obviously very important that you make sure the harness you get complies with the safety standards for the sanctioning body you plan to race with. While SFI and FIA standards are widely accepted (and are sometimes interchangeable by sanctioning body rules), some harnesses carry certification for one but not the other. Keep in mind that the certification level is also important. Tags stating the certification level are usually affixed to the harnesses themselves. The current SFI specification standard for racing harnesses is 16.1 and the FIA's current standard is 8853/98. Some harnesses may exceed these standards. While it is unlikely that a sanctioning body will require the highest possible certification standard available, the higher the certification, the more future-proof your harnesses will be. Date codes are another factor that will determine a harness's longevity. While the duration of time a harness is valid for use is determined by your sanctioning body, harnesses also carry a date code on them which specifies the maximum amount of time the harnesses could potentially be valid for use. Degradation from the stresses of racing and exposure to the elements require the harnesses to be replaced, regardless of visual condition, after a specified amount of time. Like the certification tags, these date codes will be tagged directly to the harness. Whether to opt for a 5-point or 6-point harness design is somewhat subjective. 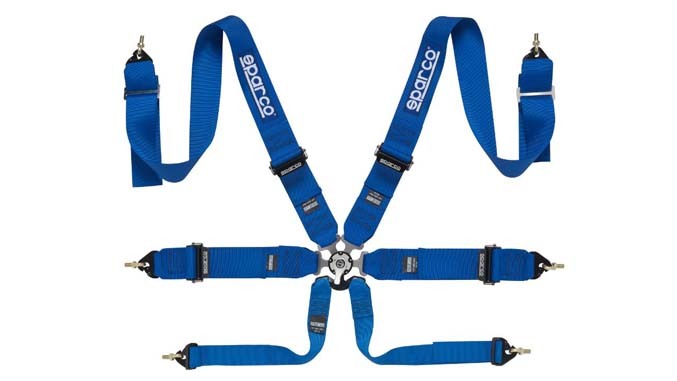 The 5-point design utilizes a single "sub" belt (the belt which connects more or less vertically from your groin area), while a 6-point harness uses two sub belts that meet with the camlock (where all the connectors meet) in more of a diagonal pattern. Most manufacturers are starting to move toward a 6-point design, as many racers prefer the 6-point configuration in terms of comfort and the added feeling of locked down stability that this design offers. The most common options for shoulder belt width are 2", 3", or 3/2". 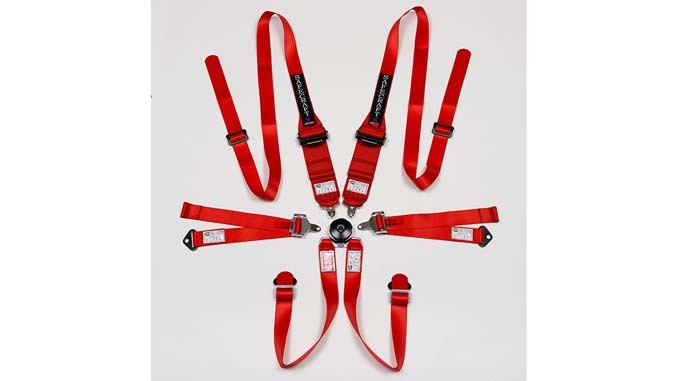 2-inch width shoulder belts ensures a comfortable fit for smaller drivers and also when using a head and neck restraint system, while 3-inch belts add a bit of bulk at the sacrifice of some comfort while wearing a head and neck restraint in order to keep the belt comfortable for use when you're not using a head and neck restraint device. 3/2" style shoulder belts seek to resolve this possible dilemma by narrowing to 2" where the straps lay over the head and neck restraint, but it is important to note that this design is not made to be used without a head and neck restraint. Before ordering any harness, check to make sure your head and neck restraint device will accept the belt width you plan to order, as some devices, like the HANS Sport II, will not accept 3" belt widths. Since there are no external devices they need to route through, lap belt width is generally a decision based on the size of the drivers who will be using the car. 2-inch width lap belts are typically easier to adjust and less bulky, while 3-inch lap belts will provide more support for larger drivers at the cost of a bit of comfort. The two most common styles of harness buckles are cam lock and latch and link. Check your rulebook before choosing a buckle style, as some sanctioning bodies will require the use of one but not the other. Most cam lock buckles are rotary - the belts are disconnected by twisting a knob on the buckle - while lever cam lock harnesses use a lever release instead. Most drivers like cam locks because of the simplicity of twisting a knob or lever to release, along with the familiarity of the passenger car-style tongue inserts for hook-up. However a few people find latch and link buckles quicker and easier to buckle together because the entire “mechanism" is visible (you are sliding metal loops over a metal tang). Note that latch and link harnesses, because each belt needs to slide off individually, are often slower to unhook (not important day to day, but possibly significant in a fire). These mounting brackets and attachments are important to consider if your harnesses are being installed in a daily-driven street car that gets track use or a race car in which the harnesses may need to be removed occasionally for maintenance work or otherwise. If the harnesses are being installed in a dedicated race car in which you do not foresee needing to remove them regularly, bolt-in mount style should fit the bill. On the other hand, if ease of removal is high on your priority list, you'll want to use belts with a "snap hook" mounting design. 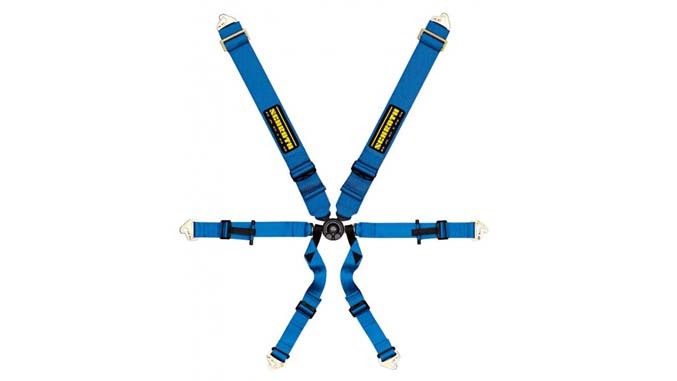 Most harnesses allow you to choose between the two when configuring your order. This is one of the most important features to consider when buying racing harnesses. Harnesses are constantly being tightened and loosened as drivers get strapped into and get out of the car, even when only one driver is using the car for a particular event. All too often, the adjusters - especially lap belt adjusters - can be stubborn to tighten or loosen, and once you're in the car, you often don't have the angle required to overpower an adjuster that doesn't want to budge. If you don't have a crew to help you make these adjustments, often times you're just left with a harness which has a strap or two which are either too loose or too tight, and both scenarios are far less than ideal from both a comfort and safety standpoint. For that reason, we highly recommend Safecraft harnesses. The high-end adjusters on Safecraft harnesses are significantly easier to tighten and loosen than any other harnesses we've used, and once you've tried them, you simply won't want to go to back. 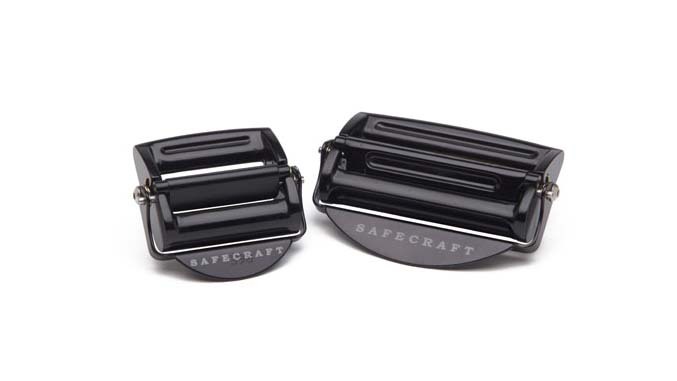 As wonderful as these harnesses are, it's worth noting that Safecraft harnesses use a wider cam lock than other brands, and the wider cam lock may not be ideal for cars that will be driven in an event by multiple drivers of significantly different heights, perhaps with an adjustable seat (e.g. in endurance racing). That’s because the cam lock in such cars may move up and down relative to the driver and the width can be uncomfortable when the cam lock is not positioned ideally. Another consideration here is whether the lap belts have adjusters that pull up or pull down to tighten. The lap belts of a pull-down harness are tightened by pulling the ends down towards the floor of the vehicle. The adjuster will be located near the buckle and will move closer to the lap belt’s mounting point on the floor as you tighten it. Pull-up harnesses locate the lap belt adjuster somewhat farther from the buckle and work by having you pull the belt toward the buckle and roof of the car to tighten. From a leverage standpoint, the pull-up design is typically easier to tighten than a pull-down design, which would require you to pull toward the floor of the vehicle to tighten the belt which often means that objects like the door, seat and floor obstruct your movement. But, pull-up adjusters have a greater potential to catch on the sides of the seat while you're tightening them, though this is largely dependent on how the harness is mounted in the car and how much room there is to the side of the seat. Another reason we're big fans of Safecraft harnesses are the small additions they include that make using their harnesses easier, like the foam pulls at the ends of the belts that make pulling the straps tight much easier while wearing gloves, as well as the loops on the shoulder belts which are designed to hook a bungee cord into so they'll be pulled out of the way of the seat when not in use, which makes getting into the car much easier since you won't end up having to fish belt straps out from underneath you once you're in the car and ready to buckle up. If you have any questions about racing harnesses that we didn't get to in this guide, post your question in the comments below! Click here to shop for racing harnesses and belts in the Winding Road Racing store.